The Greatest Show on Earth is coming to town! This year’s theme is Built to Amaze. 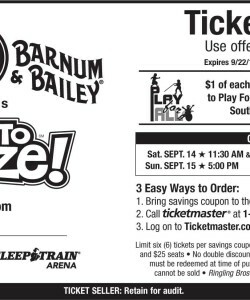 There are a lot of attractions that come every year, but the Ringling Bros. and Barnum & Bailey is special because they have been around for many, many years bringing tons of happiness and enjoyment to the masses. You can see the entire show for only $11 when you use this BUILT TO AMAZE DISCOUNT COUPON. It’s a wonderful thing to be able to see the show for this amount, especially when tickets usually run much higher. The beauty of these tickets is that $1 will be donated to Play For All to provide more Sacramento Southside Park Adaptive Events. That means you will be participating in a great cause while enjoying yourself. You can count on The Greatest Show on Earth to deliver, as they have done year after year. Make it a family event and bring the entire crew! Or you can get your club to make it a team-building exercise with fun involved. Any way you look at it, you should make sure you don’t miss all the festivities in Sleep Train Arena. It’s a great time with circus performers, acrobatics, clowns and animals – lions, tigers, elephants and more. Let’s not forget – you can’t watch the show without some popcorn or cotton candy. That’s a wonderful way to get yourself ready to have a blast! Get yourself on over to the arena to get your tickets, or you can call Ticketmaster, or you can log on and get your tickets that way. Three ways to get to the festivities and three ways to make things easier for you!